The big-sky, adventure-loving culture of the Great American Cowboy flavors fall fun as Silver Dollar City presents a new show for the National Harvest Festival. The show features the Texas Trick Riders, a high-action Western stunt show, craftsmen from around the country and top Western musicians. With a theme saluting the cowboy, the festival runs September 12 - October 26 at the Branson, Missouri theme park. 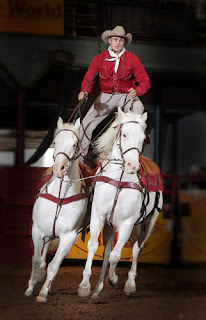 The Ozarks' leading fall festival layers in full-gallop thrills with the new Texas Trick Riders show, bringing precision trick riding, daring stunts and expert horsemanship to Silver Dollar City's Red Gold arena. Led by Austin Anderson, a third generation entertainer and professional horseman, the show presents stunts from Roman riding to flying vaults, with a troupe of 7 stunt riders and 9 horses. The show runs through October 6. 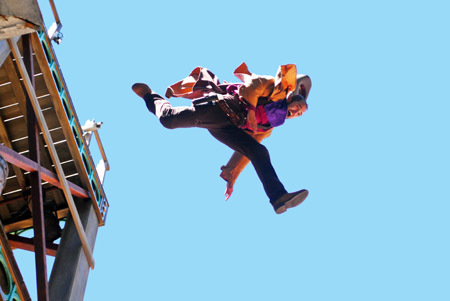 The Western stunt show "The Pinkerton Man" returns with a bigger cast and expanded fight scenes -- a musical production show that features high-flying action and special effects, including dramatic 3-story falls, high-slide rappels, hero fights, pyrotechnic effects and explosions, with professional stunt men and women leading a cast of 16, plus live animals. The production, presented within the 4,000-seat Echo Hollow Amphitheatre -- the only venue big enough for all the action, also features comedy and original live music performed by the Sons of the Silver Dollar. A major focus during the National Harvest Festival is craftsmanship, as the park features 125 top craftsmen from around the country joining the 100 demonstrating craftsmen of Silver Dollar City. Featured festival crafts include weaving, jewelry making, stained glass, basket making, gourd carving, leather crafting and painting. 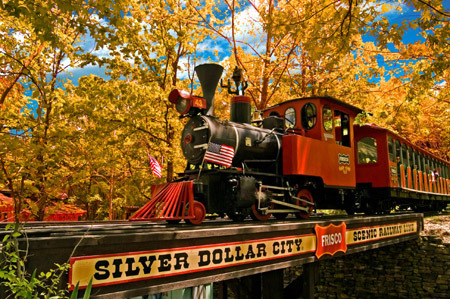 For its five-decade presentation of craftsmanship, Silver Dollar City was named "The Home of American Craftsmanship" by the U.S. Congress. Guests can experience more thrills with the park's new ride, the world's most daring wood coaster called Outlaw Run, recently named 'Best New Ride' of 2013 worldwide. Winner of the industry "Golden Ticket" Award, the $10 million ride sends passengers soaring through the Ozark Mountains on a wood coaster that includes several firsts: the world's first and only double barrel roll on a wood coaster, with a 720-degree (double) barrel roll; the only wood coaster to twist upside down with a record-breaking three inversions; the world's steepest wood coaster with a first drop of 162 feet (more than 16 stories) at 81 degrees - nearly vertical. It is also the second fastest wood coaster in the world, reaching a top speed of 68 miles per hour. Watch demonstrations for homemade soap. Salute to the Great American Cowboy features legendary Western star and water color artist Buck Taylor, September 19 - October 26. 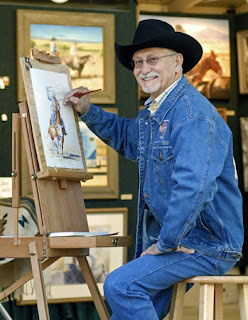 "Buck Taylor's Cowboy Emporium" showcases a variety of Western crafts from bronze sculpture to barbed wire art. A variety of award-winning Western musicians will perform at the Opera House. Cowboy Poet Chris Isaacs presents stories and poems in the style that made him a three-time winner of the Academy of Western Artists "Will Rogers Award," and Cowboy historian Rex Roberts showcases authentic cowboy memorabilia. Chuck wagon historian and chef Kent Rollins, a cattle rancher and chuck wagon cook whose talents have landed him on the Food Network's "Chopped" and "Throwdown with Bobby Flay," demonstrates trail-side cooking. Extreme Mustang Makeovers' expert Fred Woehl tames and trains rescued wild mustangs during the festival. A horseman with 35 years' experience training horses, Woehl works with the National Parks Service and the Bureau of Land Management's Wild Horse & Burro Program. 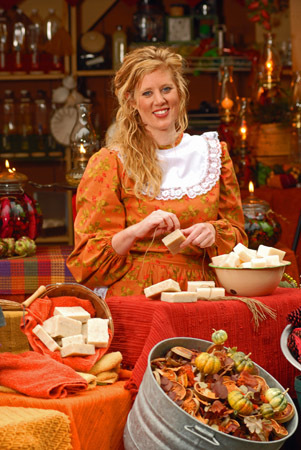 Additional harvest activities include demonstrations of sorghum and apple butter making on the Square and harvest-time foods served up throughout the park, with favorites such as homemade soups and stews, smoked turkey legs and hearty skillet meals cooked on open grills. Silver Dollar City is open Wednesdays through Sundays, 10 a.m. - 6 p.m., and 9:30 a.m. - 6 p.m. on Saturdays. www.silverdollarcity.com. Information and photos courtesy of Martha Hoy Bohner, senior publicist for Silver Dollar City Attractions.